Sennheiser is set to show its latest products, including the newly launched Digital 6000 Series wireless microphone system, at the BVE Show which takes place at ExCeL London this week between 28 February and 2 March. Also on display stand K09 will be the company’s AMBEO VR Mic, EK 6042, MKE 440, AVX and MKE 2 elements microphones, as well as its HME 27 and HMDC 27 broadcast headsets. 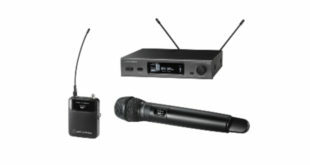 Digital 6000 (pictured, above), the latest member of Sennheiser’s professional wireless microphone range, incorporates the Long Range transmission mode and proprietary audio codec from the Digital 9000 series to deliver ‘impeccable’ RF wireless and audio performance. 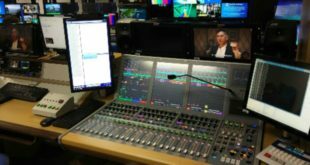 Designed for demanding live productions, Digital 6000 also addresses the challenges of the shrinking UHF spectrum by eliminating intermodulation, enabling more channels to operate in less spectrum space. The AMBEO VR Mic (pictured, below), which comes with a software plug-in for post-production of VR content, is a compact, handheld ambisonic microphone fitted with four matched KE 14 capsules in a tetrahedral arrangement, allowing the user to capture surrounding sound from a single point. As a result, users achieve fully spherical ambisonics sound to match their VR video/spherical 360 content. As well as showing the VR Mic on its stand, Sennheiser will be holding demonstrations in Gallery 4 throughout the Tuesday and Wednesday of the show. 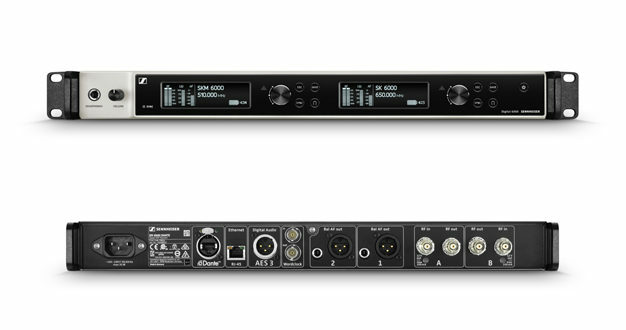 Also on Sennheiser’s stand is the EK 6042 two-channel camera receiver, which configures automatically to every professional Sennheiser transmitter, whether analogue or digital or a mix thereof, identifying transmitter types, companders and frequencies via an IR link – across a bandwidth of a full 184 MHz – in less than five seconds. Then there is the MKE 440 stereo DSLR microphone, a new V-shaped design of two mini shotguns with a stainless steel micro-mesh wind protection that provides nicely balanced stereo ambience and amplifies the sound source in front of the user’s camera. Additionally, AVX is a digital wireless microphone system that plugs directly into the XLR of a video camera, where it automatically pairs with the microphone and switches on when the camera does. 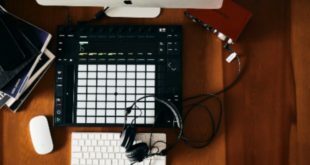 The system transmits using a specially protected link in the license-free 1.9 GHz range, which means that setting up and recording high-quality audio for video is made easier and more convenient. Also on display is MKE 2 elements, an ‘ultra-tough’ new microphone designed for high-quality audio capture with GoPro cameras. Due to its advanced capsule design, special windshield and watertight connection with the camera housing, MKE 2 elements allows GoPro users to capture high-quality sound in scenarios where audio recording currently yields poor results – or is not possible at all.